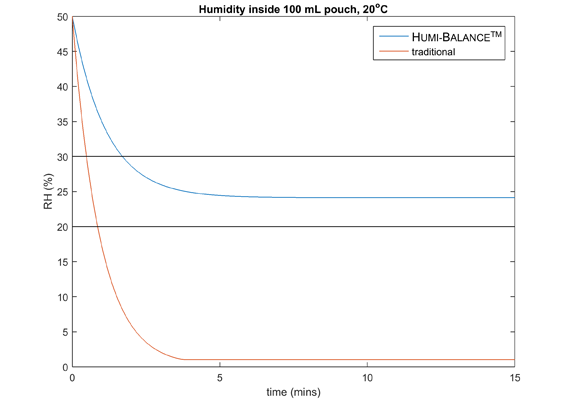 Humi-Balance™ sachets are the new innovation from Baltimore, designed to maintain a specific Humidity Balancing level, rather than reducing it to zero. This new range of products has been created for items which not only need protection from high humidity, but also need protection against over-drying (e.g. gelatine capsules become brittle and vulnerable to cracking when overly dried). These sachets work by differentially adsorbing and desorbing water molecules. So, if in-pack humidity is too high, then they adsorb moisture. Conversely, if is too low, they give-off moisture, so to increase humidity. Our SuperDrySim™ software fully supports the Humi-Balance™ SACHETS. Therefore, this guarantees shelf-life stability at the minimum cost. Also, it comes with a proven track-record of getting things right: first time without the need for burdensome and re-iterative stability trials. Cost Saving …because a full moisture-proofing of your formulation is no longer necessary. Quicker …while the amount of formulation work decreases, you can get to market sooner. Exclusive …because these sachets are only available at Baltimore Innovations. Quality …we are an ISO:9001 accredited company, so you are assured of world-class products. Bespoke …because these sachets are designed to suit your product’s exact needs. For help with your humidity control requirements or any other problems that you have, please give us a call on +44 (0)1628 531900.